Just thought I would take a moment to give you the latest update on how I'm doing on Jenny Craig. In a word - Fabulous! I'm down 23 pounds and a few pounds away to achieving a 10% weight loss and a new Jenny Craig menu. Once I hit a 10% weight loss, my menu will drop from 1500 calories to 1200 calories. I'm told by others that it's really not a big change and the adjustment to eating just a little less will be negligible. I'm not scared. I just want to be able to say there is 10% less of me taking up space in the world. I had a funny experience with the food about a week ago. I microwaved my SW Chicken Burrito and nearly spit it out when I went to take the first bite during lunch. Oh God, it was so tangy and nasty tasting. So I took another bite...just to be sure. It tasted worse than the first bite so I deemed the lunch spoiled. I sat at the lunch table eating my Bruchetta Chips and eventually bought two low-fat yogurts to fill me up for the rest of the day. It was only later that I realized the SW Chicken Burrito should have been kept frozen. I thought it was one of their lunch selections that you could store at room temp. Oh, well...lesson learned. 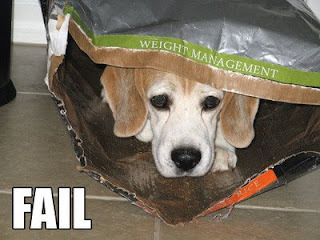 Always read the box before storing my Jenny Craig food. I did a little clothes shopping last night after work. I can now comfortably fit into XL again which is such a satisfying feeling because for a while there I was wearing 1X and sometimes even a 2X depending on the fit. I bought several blouses for work and a few pairs of dress pants that are still slightly snug in the badonkadonk region. I'll try them again in a few weeks and I'm sure they'll be fine. Spencer surprised me with a pair of Smurfette Blue Lounge Pants that I had saved to my wishlist on Amazon. You can see them by clicking here. Their largest size was XL so whenever I saw them last night, well let's just say that I thought it would be a while before I was able to wear them to bed. But I took a deep breath and tried them on just to gauge the anticipated snug fit. Much to my surprise, I managed to get both legs into them without busting the seam. Score! These blue Smurfette PJ bottoms are now my way of showing myself the progress of my weight loss efforts. Each day that passes will find them just a little less tight and eventually they will be loose on my hips just like my other pants. And when that happens, I'm going to pull out my lime XL Hello Kitty pajama bottoms that Heather got me last Christmas and RULE THE WORLD.